My husband and kids picked nine pounds of blueberries while I was at work last week. I really like blueberries and wish that the growing season was longer. A friend has a large area of blueberry bushes made up of different varieties and was having trouble keeping the birds out of the nets. So, he invited my family over to pick as many berries as possible. Although I froze a bunch, I still had a lot of fresh blueberries to use up. 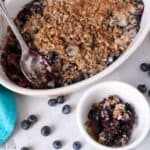 This is a an easy low carb gluten free blueberry cobbler dessert recipe that doesn’t take much time or effort. 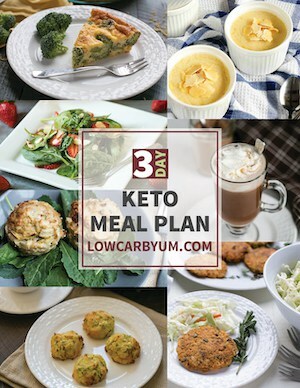 This is my favorite low carb cobbler recipe of all that I’ve tried. It tastes great and I doubt others who try it would guess it was gluten free with no sugar added. 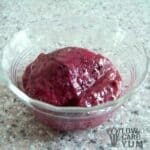 You could use any fruit you like in this low carb cobbler, even frozen fruit would be fine if you don’t have fresh. Berries are the lowest in carbs, but fruit in general should be used with caution during low carb induction and weight lose phases. If you are trying to lose weight, you may want to consume fruit in moderation because it can cause a stall in your weight loss. 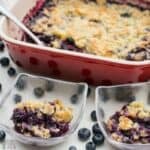 Since this low carb gluten free blueberry cobbler dessert is primarily fruit, the net carbs could be a bit high for those on stricter carb diets. Fruit does tend to kick people out of ketosis so be aware of this. 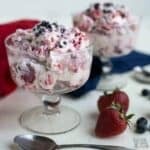 When I’m in a weight loss stage, I try not to eat more than a couple berries at a time. Blueberries do tend to be higher carb than other berries. For a comparison of carbs in fruit, you can check out this low carb fruit list. This is a wonderful keto friendly low carb gluten free blueberry cobbler dessert. 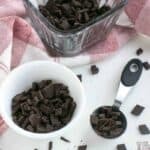 It’s perfect to take along to those get togethers where you want to make sure you have a suitable dessert that you can enjoy. 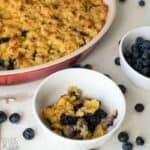 I serve this delicious fruit cobbler to my family and they never question the fact that it is low carb and gluten free. Be sure to bake it until the top is brown and crunchy. That’s the way we like it. 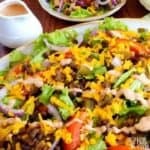 The thing I love about this recipe is that it’s so quick and easy to put together. 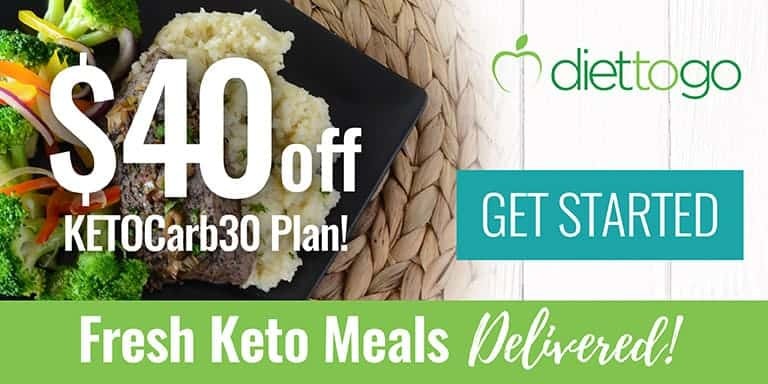 In the summer, it’s even better with a scoop of low carb ice cream on top. I keep the leftovers in the refrigerator. So, when I want a little snack, I put some in a bowl and microwave it to heat it up. It’s best to enjoy this treat warm. 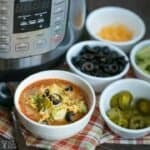 Since this is such a popular recipe for me and my family, I decided to put together a recipe video. 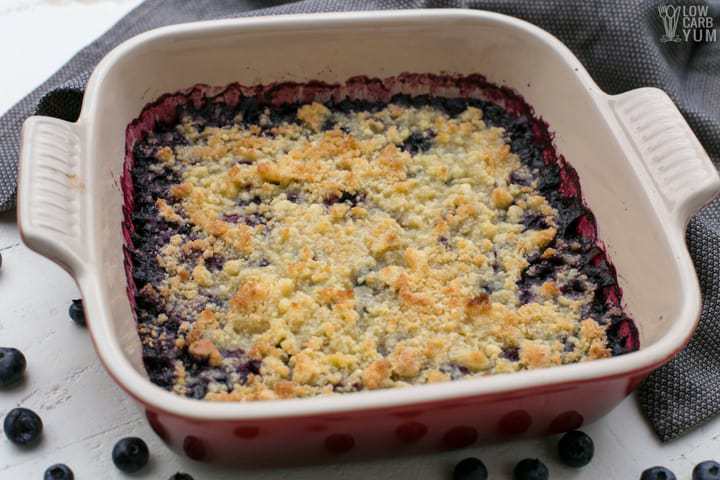 As you can see in the clips, it won’t take long to prepare this yummy low carb blueberry cobbler. I did use frozen blueberries in the video. 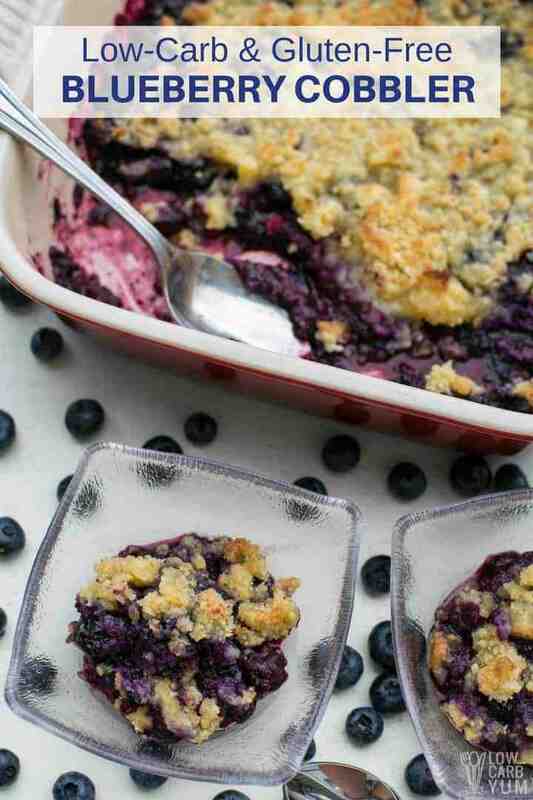 It’s best to bake the low carb cobbler a little longer if the berries are frozen. But, in the summer, we usually have a ton of fresh berries so that’s what I normally use. 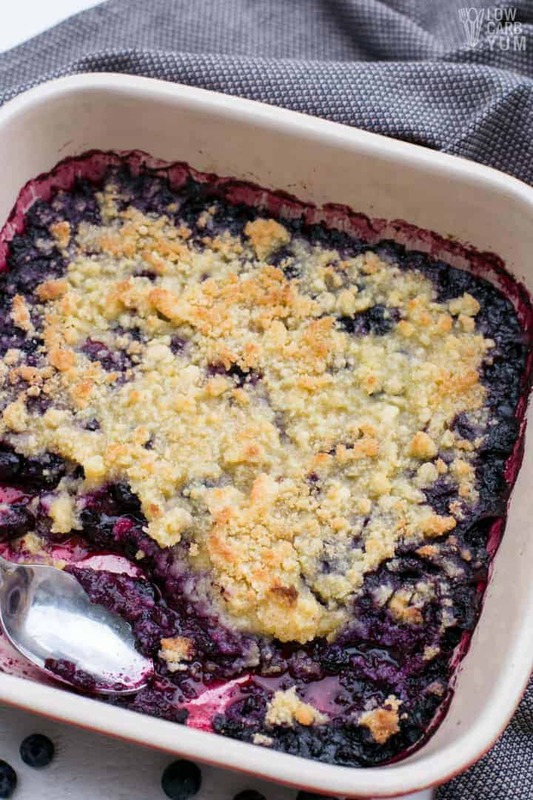 You could also top this cobbler with a crisp or crumble. If you want some recipes for that, check out my rhubarb crumble and my rhubarb crisp. 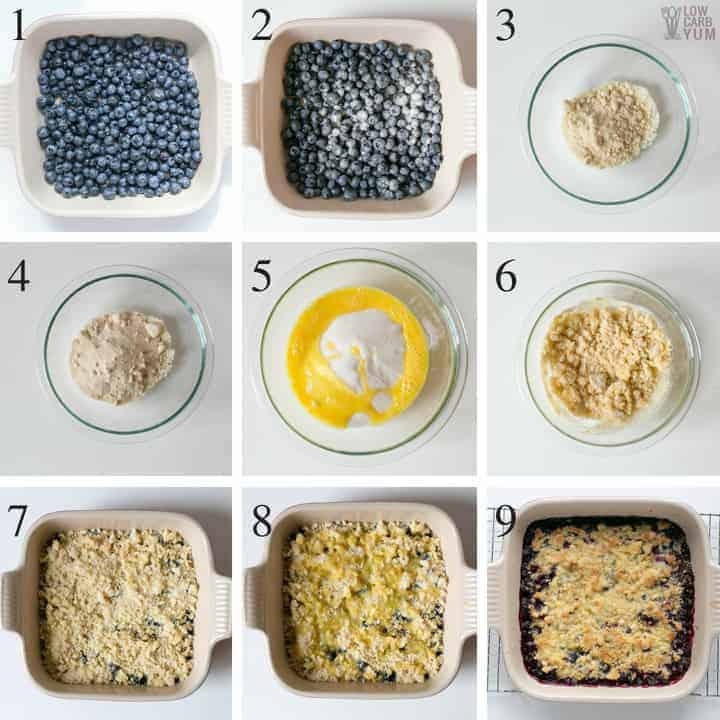 I also have a healthy blueberry crisp recipe. Blueberry season has arrived. 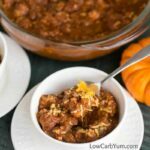 This is a really simple low carb cobbler recipe with a gluten free topping that tastes just like the real thing. Pour berries into greased 9?x9? pan. 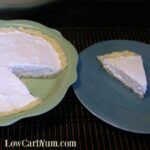 Sprinkle with lemon juice and xanthan gum. 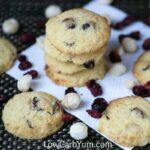 Stir almond flour, coconut flour, sweetener and egg until mixture resembles coarse meal. Bake at 350 degrees for 25 minutes or until top is browned. The sweetener in the recipe was cut way back to 1/4 cup. If you like it on the sweeter side you can more.